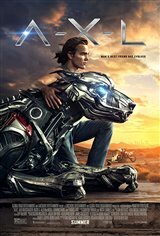 Max (Alex Neustaedter), a down-on-his luck teenage bike rider, stumbles upon an advanced, robotic military dog named A.X.L. After forming a bond, they go on the run together with Max's crush Sara (Becky G) to save A.X.L. from being captured by the rogue military scientists who created him. "I love all kinds of dogs!"